Genu varum is a Latin term used to describe bow legs. This condition may present from infancy through adulthood and has a wide variety of causes. As it becomes more severe, the patient may exhibit lateral knee thrust and a waddling gait. There may be associated in-toeing and secondary effects on the hip and ankle. The problem may be unilateral, with a functional limb-length discrepancy, or bilateral. The family and medical history may reveal clues to the likelihood of persistence or progression. It is widely recognized that up to age 2 years, infants may have physiologic bowing of the lower extremities. The hallmark of this condition is symmetrical and painless bowing, usually associated with in-toeing and often with a propensity for tripping. This problem will resolve spontaneously without treatment, as a result of normal growth. [1, 2, 3] All that is required is parental education and periodic follow-up to verify resolution. During the wait for the predicted spontaneous correction, reversing the shoes may reduce the frequency of tripping. In normal alignment, the lower-extremity lengths are equal, and the mechanical axis (center of gravity) bisects the knee when the patient is standing erect with the patellae facing forward (see the image below). This position places relatively balanced forces on the medial and lateral compartments of the knee and on the collateral ligaments, while the patella remains stable and centered in the femoral sulcus. Mechanical axis is measured on full-length weightbearing radiograph by drawing line from center of femoral head to center of ankle. Normally, it should bisect knee, with joint horizontal and parallel to ground. 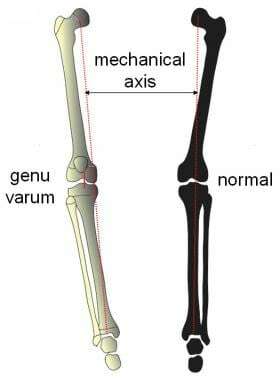 Genu varum is defined by medial displacement of mechanical axis. Shown here is tibia vara and slight lateral ligamentous laxity contributing to deformity. In children younger than 2 years, physiologic genu varum is common but is self-limiting and innocuous. In older children with pathologic genu varum, as the knee drifts laterally, the mechanical axis falls in the inner quadrant of the knee; in severe cases, it does not even cross the knee (see the image below). Three factors contributing to genu varum: femur varum, ligamentous laxity, and tibia vara. Mechanical axis is further deviated medially. As a result, the medial femoral condyle and the medial plateau of the tibia are subjected to pathologic loading. The Heuter-Volkmann effect will compress the physis and the cartilaginous anlage of these structures and inhibit the normal ossification of the epiphysis. The lateral collateral ligaments are stretched, sometimes beyond their compliance, permitting the characteristic lateral thrust of the knees during gait. When the mechanical axis deviates into or beyond the medial quadrant of the knee, regardless of the etiology, a number of clinical problems may ensue. Lateral ligamentous strain may be associated with recurrent knee pain, lateral thrust, in toeing, and the evolution of a waddling gait. The natural history of untreated genu varum is not benign. During the adult years, premature and eccentric stress on the knee may result in medial meniscal tears, tibiofemoral subluxation, articular cartilage attrition, and arthrosis of the medial compartment of the knee. Nonoperative management that relies on shoe modification, physical therapy, and so-called Forrest Gump bracing is of no proven value. Tibia vara (Blount disease) is growth disturbance of proximal medial tibia that can present any time from infancy to adolescence. Natural history is one of inexorable progression, premature closure of upper medial tibial physis, lateral thrust, ligamentous laxity, and, ultimately, joint instability and degeneration. At age 5, guided growth would have been sufficient. After physeal closure, complex osteotomies are required. Hypophosphatemic rickets is disturbance in vitamin D metabolism that weakens physes through delayed ossification. Consequent deformities may progress despite careful medical management and bracing. Deformities are typically bilateral, involving both femur and tibia. Physiologic genu varum, defined as occurring in children younger than 2 years, is exceedingly common but is self-correcting. In contrast, pathologic genu varum, which is due to a variety of conditions, is much less prevalent, especially with increasing age. 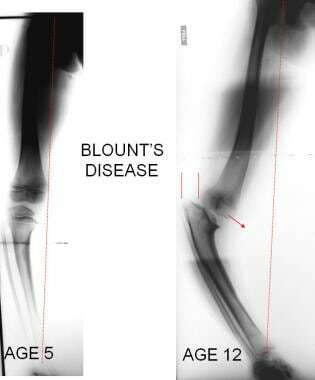 Among the known causes are tibia vara (Blount disease), rickets, and skeletal dysplasias. The collective frequency of these conditions is not specifically known, but they are common triggers for pediatric orthopedic referral. In countries where malnutrition is widespread and access to medical care is limited, the overall incidence of genu varum is undoubtedly higher. Whereas polio has been largely eradicated, other infectious diseases and mistreated (or untreated) traumatic injuries make physeal damage a frequent cause of progressive and disabling clinical deformity. Likewise, untreated congenital anomalies, genetic disorders, metabolic conditions, and rheumatologic diseases may all cause progressive genu varum. Finally, in any country, one may encounter iatrogenic postoperative genu varum. For the remainder of patients, regardless of age or diagnosis, guided growth holds promise for complete correction of the deformity and may reduce or eliminate the need for more invasive osteotomies. For specific endocrinologic conditions, concomitant medical management is required. The parents must have a vested interest in the success of the procedure and must understand that although the incisions are small and the correction gradual, the onus is on them to return for follow-up appointments at the specified intervals (typically every 3 months while the implants are in place). Heath CH, Staheli LT. Normal limits of knee angle in white children--genu varum and genu valgum. J Pediatr Orthop. 1993 Mar-Apr. 13(2):259-62. [Medline]. Salenius P, Vankka E. The development of the tibiofemoral angle in children. J Bone Joint Surg Am. 1975 Mar. 57(2):259-61. [Medline]. Kling TF Jr, Hensinger RN. Angular and torsional deformities of the lower limbs in children. Clin Orthop Relat Res. 1983 Jun. 136-47. [Medline]. Levine AM, Drennan JC. Physiological bowing and tibia vara. The metaphyseal-diaphyseal angle in the measurement of bowleg deformities. J Bone Joint Surg Am. 1982 Oct. 64(8):1158-63. [Medline]. Colyn W, Agricola R, Arnout N, Verhaar JA, Bellemans J. How does lower leg alignment differ between soccer players, other athletes, and non-athletic controls?. Knee Surg Sports Traumatol Arthrosc. 2016 Nov. 24 (11):3619-3626. [Medline]. Asadi K, Mirbolook A, Heidarzadeh A, Mardani Kivi M, Emami Meybodi MK, Rouhi Rad M. Association of Soccer and Genu Varum in Adolescents. Trauma Mon. 2015 May. 20 (2):e17184. [Medline]. [Full Text]. Machen MS, Stevens PM. Should full-length standing anteroposterior radiographs replace the scanogram for measurement of limb length discrepancy?. J Pediatr Orthop B. 2005 Jan. 14(1):30-7. [Medline]. Dietz FR, Merchant TC. Indications for osteotomy of the tibia in children. J Pediatr Orthop. 1990 Jul-Aug. 10(4):486-90. [Medline]. Paley D, Herzenberg JE, Tetsworth K, McKie J, Bhave A. Deformity planning for frontal and sagittal plane corrective osteotomies. Orthop Clin North Am. 1994 Jul. 25(3):425-65. [Medline]. Steel HH, Sandrow RE, Sullivan PD. Complications of tibial osteotomy in children for genu varum or valgum. Evidence that neurological changes are due to ischemia. J Bone Joint Surg Am. 1971 Dec. 53(8):1629-35. [Medline]. Mycoskie PJ. Complications of osteotomies about the knee in children. Orthopedics. 1981 Sep 1. 4 (9):1005-15. [Medline]. Phemister DB. Operative arrestment of longitudinal growth of bones in the treatment of deformities. J Bone Joint Surg. 1933. 15:1-15. Stevens PM. Guided growth: 1933 to the present. Strategies Trauma Limb Reconstr. 2006. 1:29-35. [Full Text]. Canale ST, Russell TA, Holcomb RL. Percutaneous epiphysiodesis: experimental study and preliminary clinical results. J Pediatr Orthop. 1986 Mar-Apr. 6(2):150-6. [Medline]. Ogilvie JW. Epiphysiodesis: evaluation of a new technique. J Pediatr Orthop. 1986 Mar-Apr. 6(2):147-9. [Medline]. Bowen JR, Leahey JL, Zhang ZH, MacEwen GD. Partial epiphysiodesis at the knee to correct angular deformity. Clin Orthop Relat Res. 1985 Sep. (198):184-90. [Medline]. Blount WP, Clark GR. Control of bone growth by epiphyseal stapling. J Bone Joint Surg. 1949. 31A:464-71. Blount WP. A mature look at epiphyseal stapling. Clin Orthop Relat Res. 1971. 77:158-63. [Medline]. Frantz CH. Epiphyseal stapling: a comprehensive review. Clin Orthop Relat Res. 1971. 77:149-57. [Medline]. Fraser RK, Dickens DR, Cole WG. Medial physeal stapling for primary and secondary genu valgum in late childhood and adolescence. J Bone Joint Surg Br. 1995 Sep. 77(5):733-5. [Medline]. Mielke CH, Stevens PM. Hemiepiphyseal stapling for knee deformities in children younger than 10 years: a preliminary report. J Pediatr Orthop. 1996 Jul-Aug. 16(4):423-9. [Medline]. Stevens PM, Maguire M, Dales MD, Robins AJ. Physeal stapling for idiopathic genu valgum. J Pediatr Orthop. 1999 Sep-Oct. 19(5):645-9. [Medline]. Zuege RC, Kempken TG, Blount WP. Epiphyseal stapling for angular deformity at the knee. J Bone Joint Surg Am. 1979 Apr. 61(3):320-9. [Medline]. Métaizeau JP, Wong-Chung J, Bertrand H, Pasquier P. Percutaneous epiphysiodesis using transphyseal screws (PETS). J Pediatr Orthop. 1998 May-Jun. 18(3):363-9. [Medline]. Stevens PM. Guided growth for angular correction: a preliminary series using a tension band plate. J Pediatr Orthop. 2007 Apr-May. 27(3):253-9. [Medline]. Jelinek EM, Bittersohl B, Martiny F, Scharfstädt A, Krauspe R, Westhoff B. The 8-plate versus physeal stapling for temporary hemiepiphyseodesis correcting genu valgum and genu varum: a retrospective analysis of thirty five patients. Int Orthop. 2012 Mar. 36 (3):599-605. [Medline]. Böhm S, Krieg AH, Hefti F, Brunner R, Hasler CC, Gaston M. Growth guidance of angular lower limb deformities using a one-third two-hole tubular plate. J Child Orthop. 2013 Oct. 7 (4):289-94. [Medline]. Aslani H, Panjavy B, Bashy RH, Tabrizi A, Nazari B. The efficacy and complications of 2-hole 3.5 mm reconstruction plates and 4 mm noncanulated cancellous screws for temporary hemiepiphysiodesis around the knee. J Pediatr Orthop. 2014 Jun. 34 (4):462-6. [Medline]. Novais E, Stevens PM. Hypophosphatemic rickets: the role of hemiepiphysiodesis. J Pediatr Orthop. 2006 Mar-Apr. 26(2):238-44. [Medline]. Ballal MS, Bruce CE, Nayagam S. Correcting genu varum and genu valgum in children by guided growth: temporary hemiepiphysiodesis using tension band plates. J Bone Joint Surg Br. 2010 Feb. 92(2):273-6. [Medline]. Kulkarni RM, Ilyas Rushnaiwala FM, Kulkarni GS, Negandhi R, Kulkarni MG, Kulkarni SG. Correction of coronal plane deformities around the knee using a tension band plate in children younger than 10 years. Indian J Orthop. 2015 Mar-Apr. 49 (2):208-18. [Medline]. [Full Text]. If knee is divided into quadrants and variations of normal allowed for, mechanical axis should be neutral or at least fall within medial or lateral zone 1. Deviation into zone 2 is relative indication for surgical intervention, and zone 3 is obvious call for action. If physes are open, correction may be gained by guided growth; after skeletal maturity, only choice is corrective osteotomy. Anatomic angles are measured between joint surface of each bone and its respective shaft. Lateral distal femoral angle (LDFA) is normally 84°, and proximal medial tibial angle (MPTA) is 87°. On close-up view, one can measure joint convergence angle (normally 0°); this is defined by articular surface lines of femur and tibia. Lateral ligamentous laxity can contribute to varus malalignment. Child wore her braces religiously, only to experience steady progression of deformities. At 2 years after guided growth of distal lateral femora and proximal lateral tibiae (and without further bracing), patient's legs are straight. She will be monitored as she continues to grow. This 7-year-old boy with Ollier disease presented with complex deformity including varus and outward torsional deformity of right tibia and progressive limb length discrepancy. Whereas guided growth could improve varus, it could not address other two issues. Therefore, he underwent osteotomy and callotasis with Taylor Spatial Frame. This 4-year-old girl with Job syndrome, which includes immunoglobulin deficiency, had osteopenia and developed pathologic fracture of proximal tibia. She then drifted into progressive genu varum. It was felt that guided growth might not work in mechanically compromised environment. Patient underwent corrective osteotomy of upper tibia and fibula, supplemented with cast. At age 5, this boy presented with asymmetrical tibia vara (Blount disease). Treating surgeon employed guided growth on right and osteotomy of tibia/fibula on left. At 14-month follow-up, mechanical axis is neutral on right, and plate was removed. Mechanical axis was in medial zone 2; this was addressed by insertion of lateral eight-Plate. After additional 8 months of guided growth, leg straightened out, and plate was removed. Patient's limb lengths remain equal, and there has been no recurrence of angular deformity. Annual monitoring will continue until maturity: if there is any drift of mechanical axis, guided growth will be repeated. At 1 year after proximal tibial stapling to correct limb length inequality, this scanogram shows loosening of lateral staples with consequent iatrogenic varus of tibia. Physes are still open. Full-length view shows mechanical axis deviation into medial zone 2; this was not demonstrable on scanogram. Staples were removed and lateral ones replaced with eight-Plate. At 1 year after guided growth with eight-Plate, mechanical axis has been restored to neutral. At that time, eight-Plates were employed to accomplish pan-genu epiphysiodesis to correct patient's residual limb length inequality. This 20-month-old boy presented with waddling gait and hip pain. His father has same condition and had osteotomies of his tibias, femora, and hips during childhood. He anticipated similar treatment for his son. Standing anteroposterior (AP) radiograph demonstrates varus deformities at hips, knees, and ankles, with mechanical axis in medial zone 3 bilaterally. Traditional treatment would have included staged osteotomies of proximal and distal femora and of proximal and distal tibiae and fibulae, requiring x number of casts and hospitalizations. Presenting AIR (abduction, inward rotation) view of pelvis shows "triangular defect," which is essentially stress fracture, of each femoral neck. This would explain his hip pain and Trendelenburg gait. Sequential radiographs demonstrate neutralization of mechanical axis during 13 months following guided growth. This was performed as outpatient procedure, requiring no immobilization. Upon removal of pan-genu eight-Plates (2/07), additional plates were applied to greater trochanter in hope of gradually increasing neck-shaft angle and obviating need for proximal femoral osteotomies. Clinical photographs taken at age 20 months and at age 2 years 9 months. Whereas complication rate of guided growth with eight-Plates remains low, there have been isolated cases of broken screws. Each broken screw has been distal (metaphyseal) screw in heavy-set patient with Blount disease. Potential solutions are to insert solid 4.5-mm screw or to add second eight-Plate.